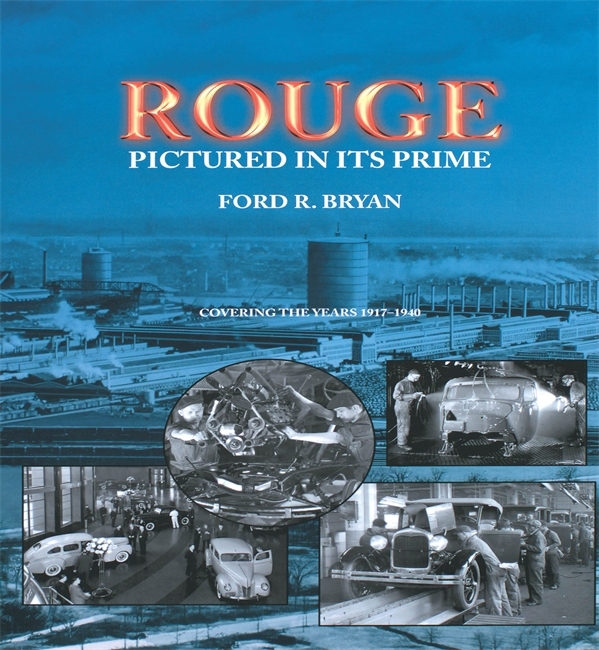 Rouge: Pictured in Its Prime joins a solid shelf of equally fine books by Ford Bryan that document the many facets, friends, and activities of Henry Ford. When Ford Motor Company was formed in 1903, its primary assembly plant was a wooden one-story wagon shop, but as the auto manufacturer grew, so did its factories. By 1917, building on his experience with the Piquette and Highland Park plants, Henry Ford began constructing his ultimate vision of an efficient and effective industrial complex on the banks of the Rouge River. In its time, "The Rouge," as Detroiters called it, was the largest integrated automobile factory in the world, with facilities that included an electric power plant, blast furnaces, foundries, coke ovens, open hearth furnaces, a steel mill, stamping plant, engine plant, glass plant, and miles of conveyors bringing manufactured parts to moving assembly lines. The Rouge was able to provide over 100,000 jobs and effectively gave birth to the city of Dearborn. Rouge: Pictured in Its Prime, featuring 389 photographs taken within 45 different departments of the Rouge by Ford photographers from 1918 to 1940, provides a realistic portrait of buildings, machinery, and employees at work during a twenty-two year period. The illustrations were selected from a collection of more than 70,000 Rouge photographs located in the Benson Ford Research Center of Henry Ford Museum & Greenfield Village. In the accompanying text, Ford R. Bryan chronicles the history of the Rouge plant, from its earliest conception to its future in the twenty-first century. The Rouge dominated an era of industrial progress and this photo story brings the monumental facility to life in stunning fashion. Ford R. Bryan, who lives in Dearborn, Michigan, has written many books about Henry Ford, including Friends Families,& Forays, Clara: Mrs. Henry Ford, The Fords of Dearborn, Henry’s Lieutenants, Beyond the Model T, and Henry’s Attic (all Wayne State University Press). He joined Ford Motor Company as a spectrochemical analyst. His yen for writing led him to the Ford Archives, where he found a gold mine of material about his own family and about his favorite subject, Henry Ford. This book has many strengths. It is a wonderful memorial to the almost mind-boggling size and scope of the Rouge facility. It is also a testament to Ford products and Ford himself, whose personality appears to have been woven into the factory. Bryan's book is absolutely fascinating and a must read for anyone interested in the history of the automobile, or Henry Ford. It wonderfully captures a bygone era in America capitalism when bigger was better and when American innovations and production ruled the world. A visual treat and a magnificent tribute to American auto history, every coffee table in the country would be proud to hold this 288-page book. As absolute must for Fordophiles and historians alike." This 288-page book is an absolute must for Fordophiles and historians. It is always a pleasure to learn that a record is being set straight or a story is being told that has not been heard completely. It is an even greater pleasure when one discovers that it is done with style, accuracy, and great visual appeal. Ford Bryan's book, Rouge: Pictured in Its Prime, is just this sort of historical presentation. The story of Ford Motor Company's world-famous Rouge factory has been told in footnotes and photo essays, but never in the kind of detail presented by Mr. Bryan. . . . Rouge: Pictured in Its Prime joins a solid shelf of equally fine books by Ford Bryan that document the many facets, friends, and activities of Henry Ford.